Happy, Happy Friday!!! I am so ready for the weekend, and I'm super excited to share today's card with you. It has been a LONG time since I went full blown "distress mode" on a card. Years I think. And it was so much fun!!! I have a baby shower to attend for one of my nieces this weekend, and she's from an antique loving family. Her colors were navy and gray, so I thought I'd lean towards grays for this baby card. I added some yellows to make it a little more happy. I used Power Poppy's Precious Baby stamp set. This image includes a set of baby blocks, but I didn't think they fit well proportionally on the card, so I just cut them off. Easy peasy. Below is a close up of the image. For the inside, I used another of the sentiments included in this set. Thanks for visiting!! I hope you have an awesome weekend filled with creative ideas!! Happy, Happy Friday!!! 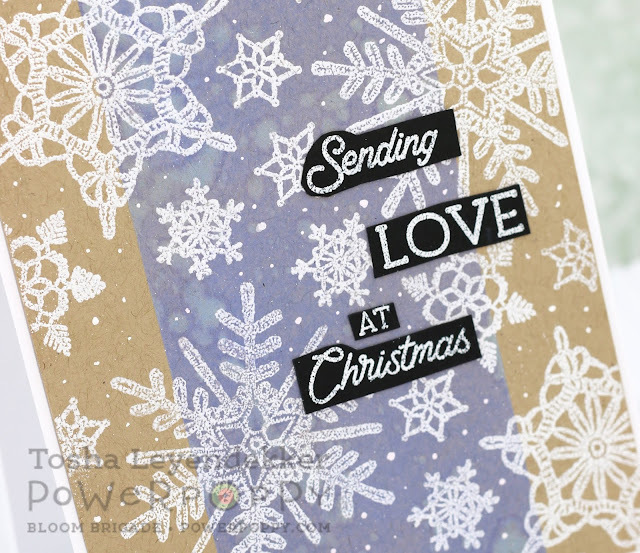 I am so excited to share this card with you today. Most of the time...seriously, almost every time...I have an idea, start to implement it, and my card takes a number of different turns, not even close to where my idea started. But today's card...went exactly as planned, and I'm so happy with the result. I started by printing out Power Poppy's Sunset Sway image onto X-Press It blending cardstock. I then diecut it to the size I wanted. Then, using a clear ruler and pencil, I lightly added some blocking to the background. After I had the design I wanted, I colored the background with Copic Markers, starting with the darkest of the colors by the lines, and lightening as I went out. (Except for behind the flowers: the darkest areas are close to the petals and leaves.) Then, using my Copic 0 (blending marker) I used the wedge side to make bricks. (I learned this from Jennifer Dove at Boot Camp...so many techniques to learn there.) For the turquoise and orange background, I blotted Copic blending solution very lightly using a slightly doused natural sponge. Now, for the Sunset Sway image. I printed it out two times so I could color the flowers separately, burnish them (Click HERE for the burnishing technique tutorial I posted to the Power Poppy blog), and pop up the petals on the main image. 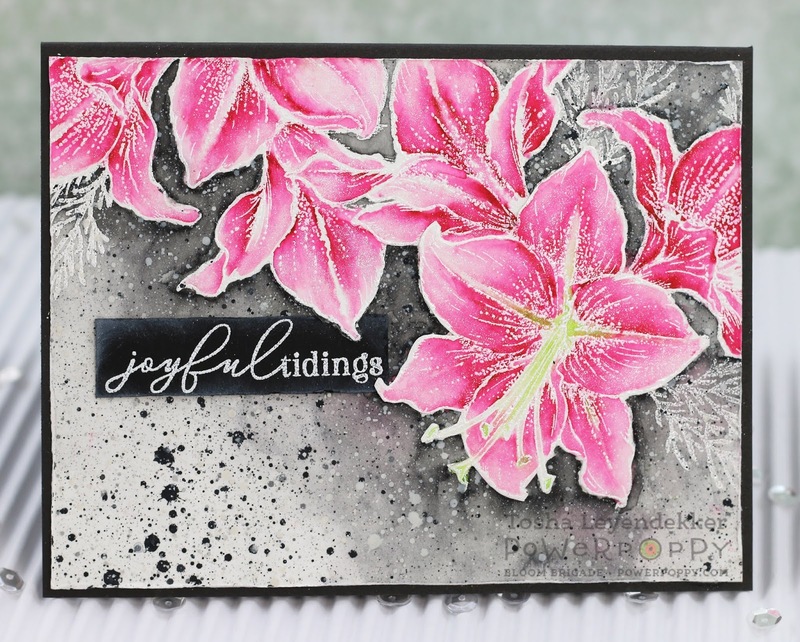 But, before I added the flowers, I stamped the sentiment, on the bottom, using the clear stamp set Pure Prairie Spirit, and splattered some black and white acrylic paint to the background. Below I hope you can see the dimension to the flowers and butterfly. I glued down the bases of each and added dimensional tape to the petals and butterfly wings. 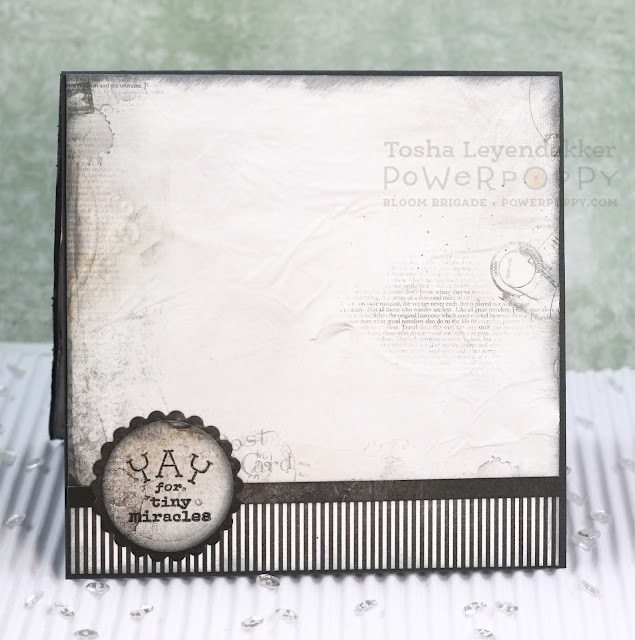 Lastly, I added the Versamark stamped and embossed sentiment "dear friend" from the Always Here Power Poppy clear stamp set, after distressing the edges, as well as all the edges of the main panel. Thanks a bunch for dropping by! I hope you have a wonderful weekend!! I have a CAS masculine card to share with y'all today. I've been having fun with my Tim Holtz Mixed Media #4 Thinlits. Today I used the Stones. Click Here to read about how I add them to my cards. 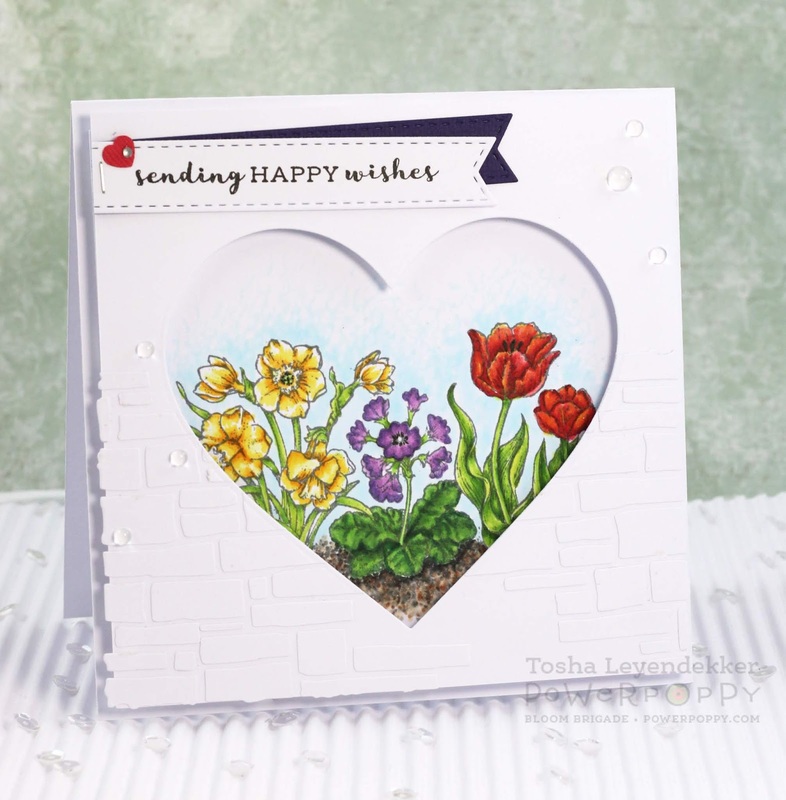 For my sentiment, I used the Power Poppy Stamp set Good Thinking Love Notes. 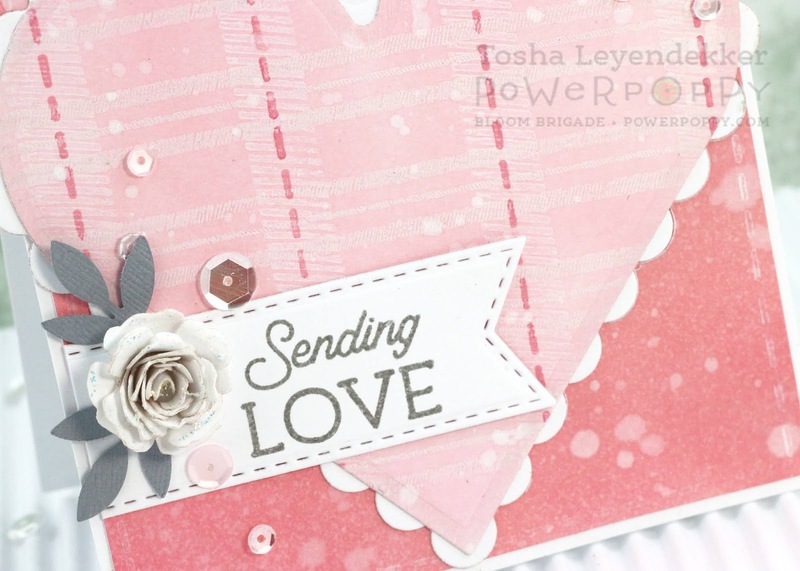 They are out of stock right now, but Power Poppy has a variety of sets that include loving sentiments. Click HERE to see just a few of them. Thanks for dropping by. I hope you are enjoying a productive and creative weekend! Hello my creative friends!!! I hope you are all doing well and have been finding a ton of inspiration all around you. Before I talk about my post though, I have to just say, my heart goes out to all those in the Midwest states who are suffering such rigid temperatures. I experienced a -60 degree (with windchill) day while in college in the 1980's, and it isn't a day I would ever choose to revisit, that's for sure. I'm praying you all stay warm and safe!!! Now, for today's card. I thought I'd bring a little sunshine and love with Spring flowers framed with a heart. 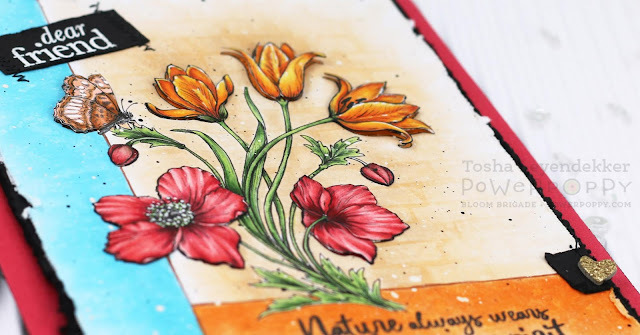 I used Power Poppy's Natural Beauties stamp set. I colored the image with Copics, and diecut a heart out of a 5 1/4 x 5 1/4" piece of cardstock. 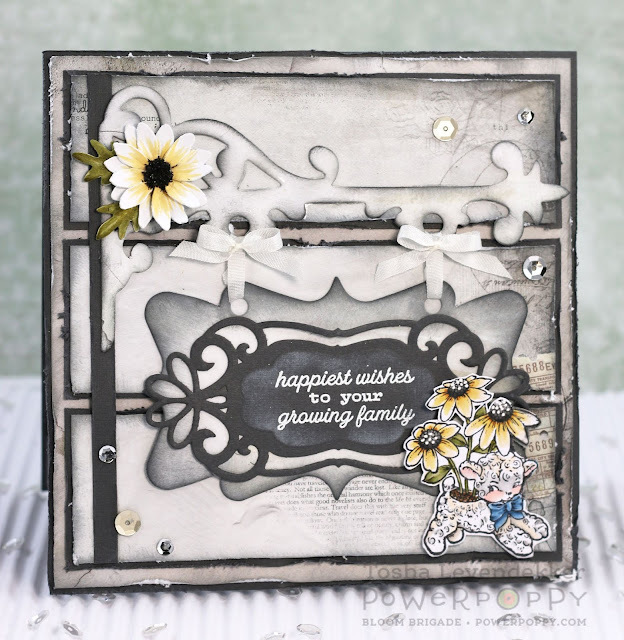 I then added bricks that I diecut using one of Tim Holtz's Mixed Media #4 Brick Thinlits. I diecut a separate piece, laid the negative over my piece of cardstock and glued the pieces inside their frames. I then removed the negative diecut piece and voila...you get a brick background. I hope that all just made sense. I also added some sweet little Clear Drops that I got from Studio Katia. Below is a close-up so you can see the brick detail better. That's it for my project today, But before you go, I have a Power Poppy Special to share with you. 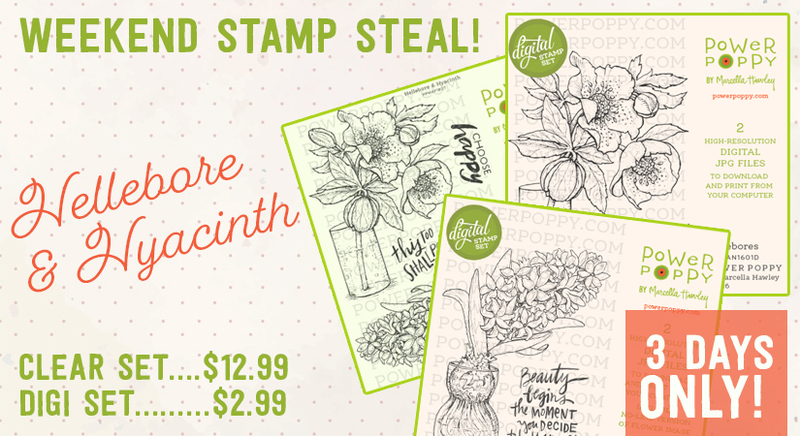 The clear set Hellebore and Hyacinth is on sale for $12.99, and the two digi sets Hellebores and Hyacinth Bulb in Glass are on sale for $2.99. You better hurry though. The sale is only good through Sunday. Now, be sure to visit the following Bloom Brigade Blogs for some more inspiration!!! I'm so glad you dropped by. I hope you have a beautiful, safe, inspired weekend!! 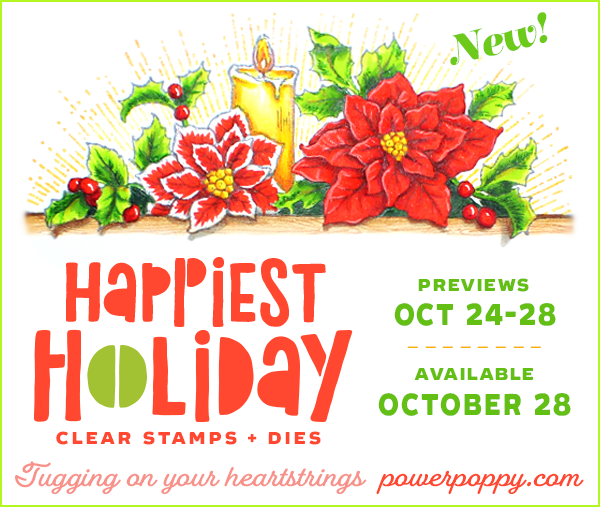 I hope you haven't stored away all your Power Poppy Christmas stamp sets yet. Because some of them still have some months of use left in them. 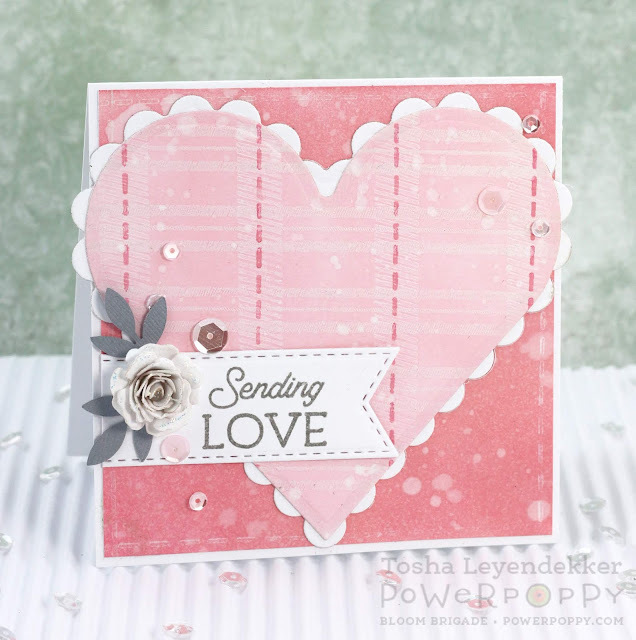 I hauled out the Snuggle Down set along with Grandma's Snowflakes to make this sweet Valentine's day card. I used the plaids from the Snuggle Down set, and the sentiment (from Grandma's Snowflakes) is just shortened by isolating the top part of the sentiment. I just taped off the "at Christmas" part with repositionable tape, inked it up with Smokey Gray Versafine ink, removed the tape and stamped. I sponged on some Distress Oxide inks for the the backgrounds and inked up the stitched plaid stamp with Worn Lipstick (Ranger Distress Oxide). I love how the Oxide inks respond to water platters. The rest of the plaid was stamped with Whisper White pigment ink by Stampin' Up. The rose was made using a Bitty Blossoms Spellbinders die, and the leaves are from a Martha Stewart punch. If you look close, you can see that I added stitching to the square background with one of the Snuggle Down Plaid stamps too. It's very subtle. That about sums up my project for today. I hope you are enjoying the tail end of 2018, and that 2019 is filled with wonderful memory making moments!! Hello everyone. It's been quite awhile since I've posted and I'm very sorry. Life has a way of interrupting our plans and expectations sometimes, and I haven't been able to stamp like I'd like to. But I'm back, and excited to share my creation with you today. 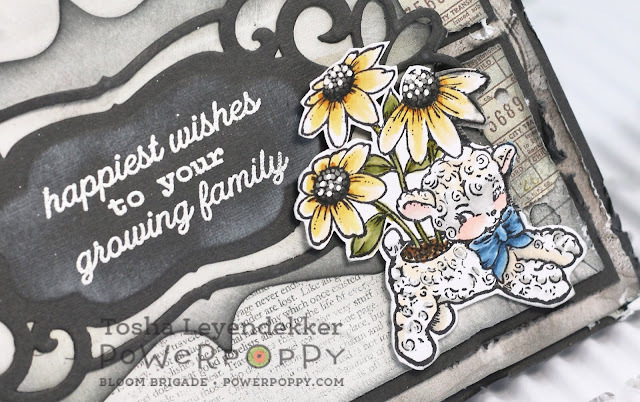 I had fun combining two very different Power Poppy stamp sets: Grandma's Snowflakes and O Hoppy Day. 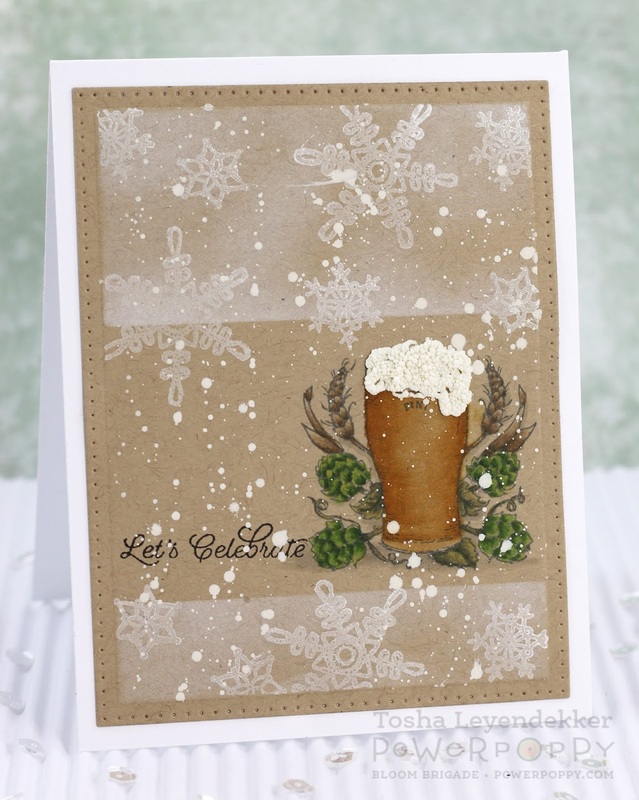 There are quite a few birthdays that we celebrate in December, and I've been told (I don't drink beer, so I'm going according to what others have said), that beer is best when it's really, really cold. So, I thought...snow is cold...why not combine these two sets for some fun, to celebrate a friend's birthday. I started by diecutting a piece of kraft cardstock, left it in the die, and taped it to my surface. I masked off a 2 1/4" stripe on the bottom third, and then sponged on some Whisper White (SU!) pigment ink. I removed the masking and stamped the Grandma's Snowflakes. Then, I stamped the O Hoppy Day image with Gray Flannel (Memento) Ink and colored it with Copics. 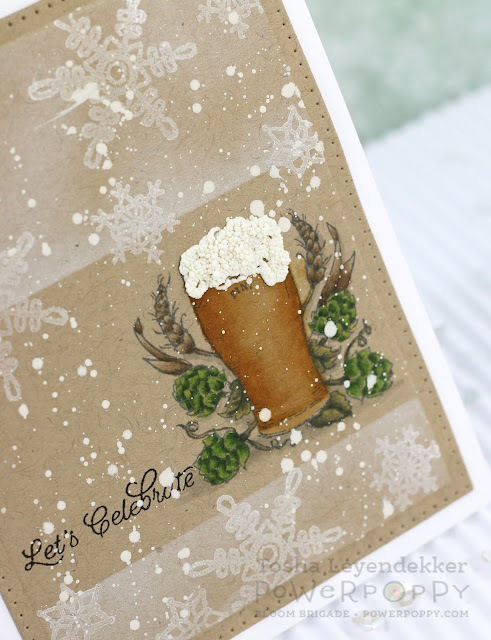 I used Liquid Applique for the foam, and the sentiment was stamped with Onyx Black (Versafine). Lastly, I splattered on some white acrylic paint, and voila...you can see more detail below. That's it for my project today. Be sure to check out the following Bloomie blogs for some incredible inspiration!!! I hope you have the most Blessed Christmas!!! Isn't this little tree in a bucket just adorable? It's from one of Power Poppy's newest Christmas sets called Through the Woods. I kind of did a "no-line" coloring technique. Now, it's not totally no-line because I used too dark of a gray to stamp the image. Thus the gray outlined birds, stars and white ornaments. It worked for the bucket and tree though. Below is a close up so you can see how I added White Nuvo Crystal Drops with some Cool Highlights Transparent Microfine glitter (Glitter Ritz) for some dimension. I hope you can see the sparkle. 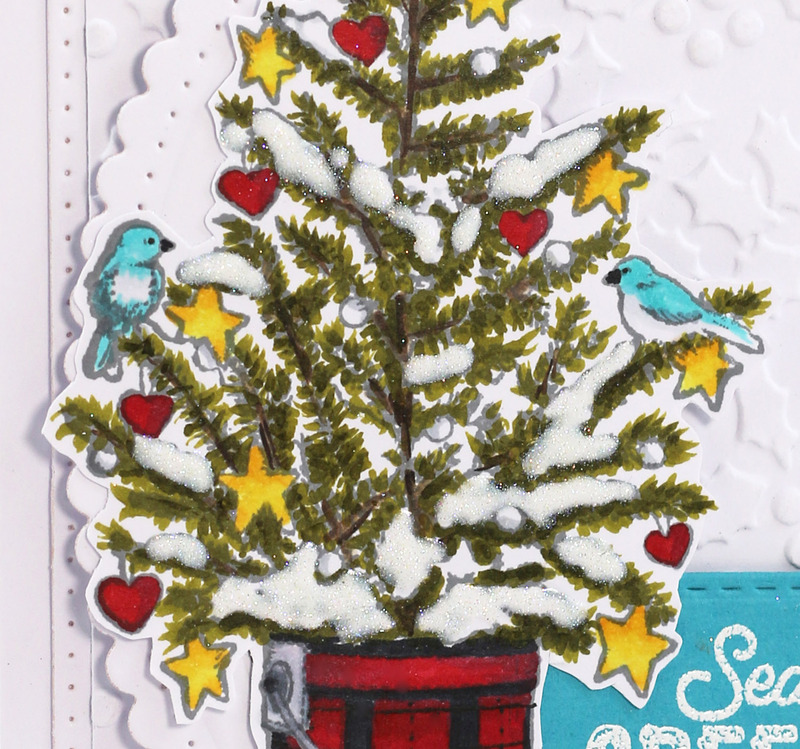 By sharing this ultimate close-up, you can also see my marker flicks on the branches, and where I missed some. Man, I wish my eyes could see this close up while coloring. Because the image is only about 4" high, I was doing a lot of guess work while coloring the tree. I even used a magnifier to make sure I got the black lines added correctly, on the bucket, with a multi-liner. If you ever get a chance to attend one of Jennifer's Boot camps, I highly recommend doing so. Not only did I learn A TON, but I had a blast doing so. Everyone is so helpful and entertaining at the same time. That's it from me for today. Short and sweet. 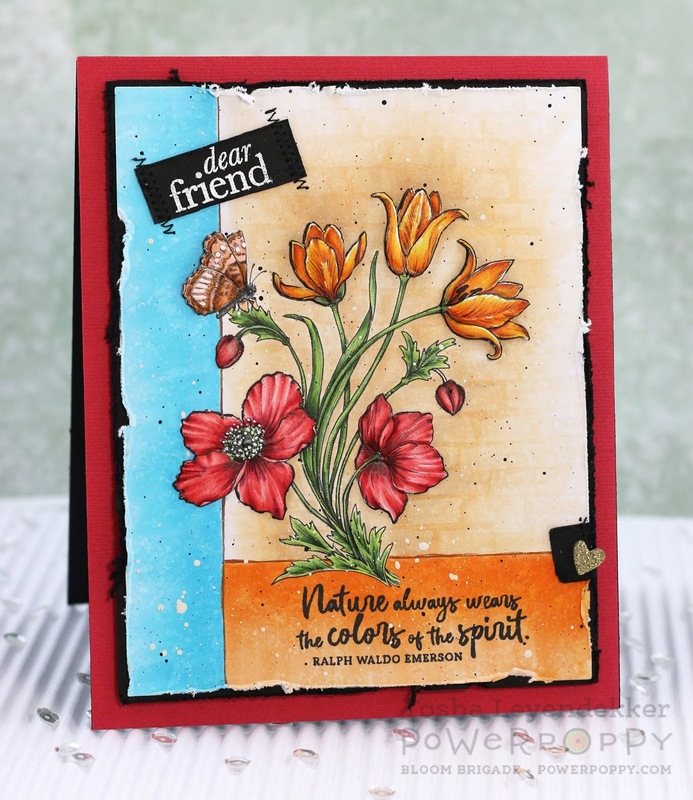 Be sure to stop by Stacy's blog to see what she has to inspire you with today. 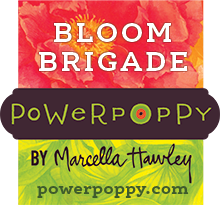 Power Poppy Release Day is finally here!!! The entire Happiest Holiday 2018 collection is available as well as some coordinating dies!! Woo-Hoo!!! 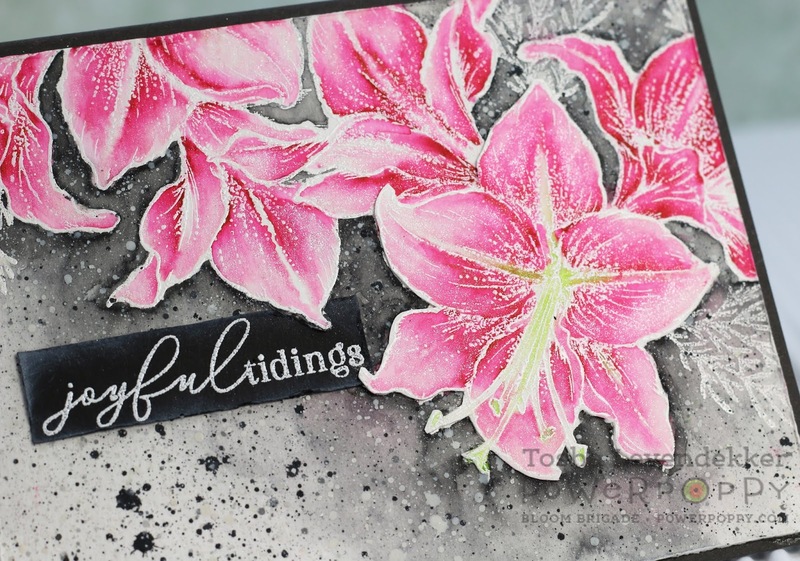 For our last little preview, we are sharing this gorgeous Amaryllis Bliss set. 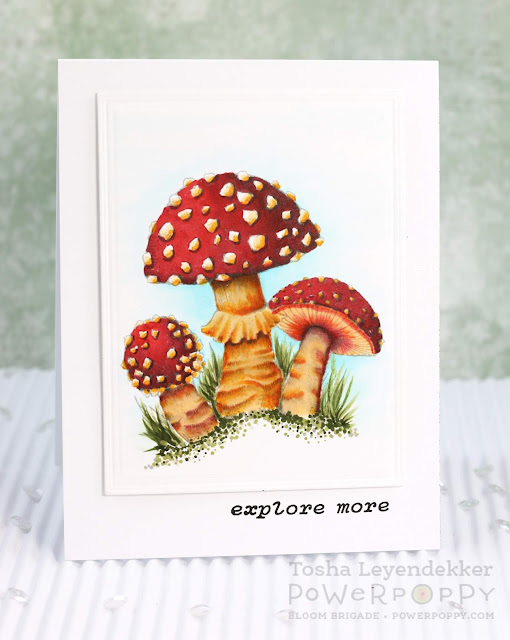 I stamped the image with Versamark onto watercolor paper and embossed it with white. I then masked it off and added a few more stamped images. I then colored it all with my Zig Clean Color Markers and added a few splatters. I added some Glitter Gloss (Nuvo) to all the petals to sparkle it up a bit. It's a nice subtle shine irl. I'm hoping you can see it better if you click on the photos. 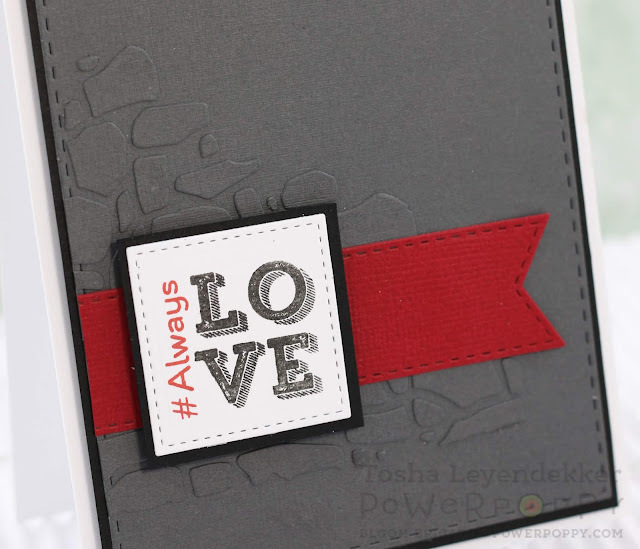 The sentiment was stamped onto black cardstock with Whisper White pigmented ink (SU! ), and embossed with white ep. I also sponged some of the Whisper White along the edges to soften it up a bit. Thanks for visiting!! I hope you've been a bit inspired this week!! Hello everyone!!! 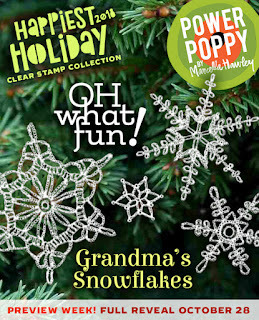 Oh my goodness did I ever have THE...BEST...TIME working with the new Power Poppy set Grandma's snowflakes!!! They are just super charming and they remind me of crocheted doilies. I love anything vintage, so these babies are right up my alley!! 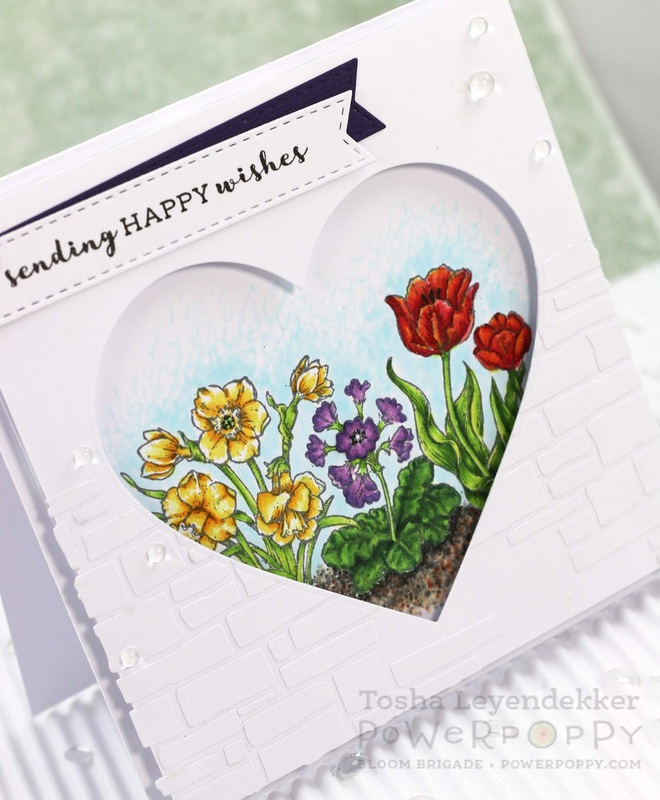 This card is super easy, and came together in an hour. I know right? That is unheard of in my world. 3-4 hours/card is usually the standard for my card making skills. But this one, designing, trial-and-errors and all...1 hour. Woot-Woot!! I started with a standard A2 size piece of kraft cardstock. 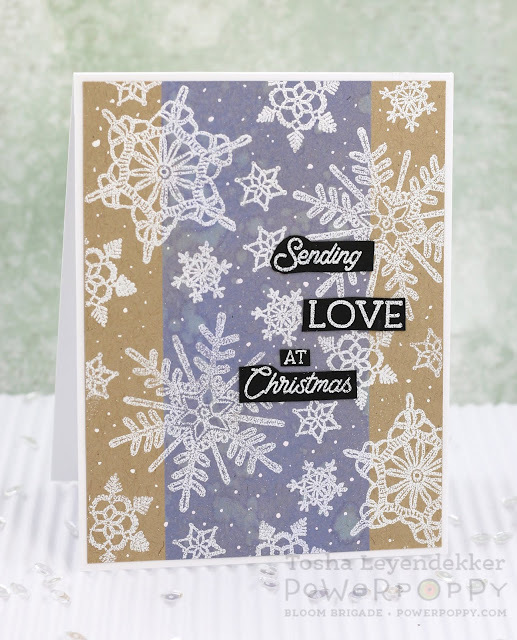 I stamped all the snowflakes onto it with Versamark, and heat embossed them with Super Fine Detailed White Embossing Powder (Ranger). I then masked off a 3/4" border on each side and sponged Shaded Lilac Distress Oxide ink onto the cardstock. After it dried a bit, I sprinkled water on it, let it dry and removed the mask. Lastly, I used a Sakura Gelly Roll 10 pen to add some white flecks to the background, and fussy cut the individual words from the sentiment that I heat embossed in white on black cardstock. Now, be sure to check out what the following Bloom Brigade members have to share with this set. I know you'll be inspired!! Thanks for visiting and for the kind comments. They truly brighten my day. Happy Friday!!! Have you been enjoying the Power Poppy previews the last couple of days? Well, I hope you enjoy these next ones just as much. 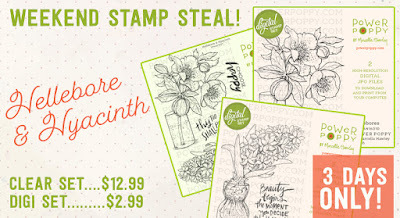 Today, the Bloom Brigade is featuring two warm and cozy sets, and they are just super adorable and charming!! I used mainly the stripes in the Snuggle Down set to make my plaid background, and I have 4 cards to share. Each one has the same plaid design with entirely different looks and feel. super easy to replicate in different colors. I used 5 different cardstocks, three different foils, and one plaid design in which I used all the stripes Marcy included in this set. I also used the ribbon and bells set from Through the Woods. I went a bit modern with my first one. 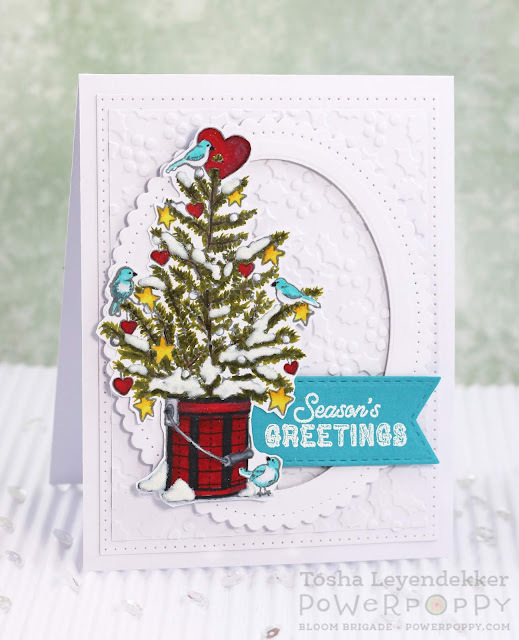 The background is dry embossed to give it a knitted sweater feel with the cool turquoise/white plaid. I just photocopied my design onto turquoise cardstock and Minc'ed it with white foil. Minc'ing is great for getting fine details in images. I heat emboss too, but I can get stray flecks, and sometimes embossing powder can get overly thick. That's why, when I have very fine details like the silver bells and ribbon, and the fine plaid stripes, I go straight for my Minc machine. The red/black plaid feels like a cozy blanket to me, so I used black foil on red cardstock and diecut the background with Spellbinders' Square Swatches die. Last, but not least, I have an elegant, shiny plaid to share with you, that I combined with the ribbon and bow image from the Through the Woods stamps set. All are Minc'ed with silver foil. 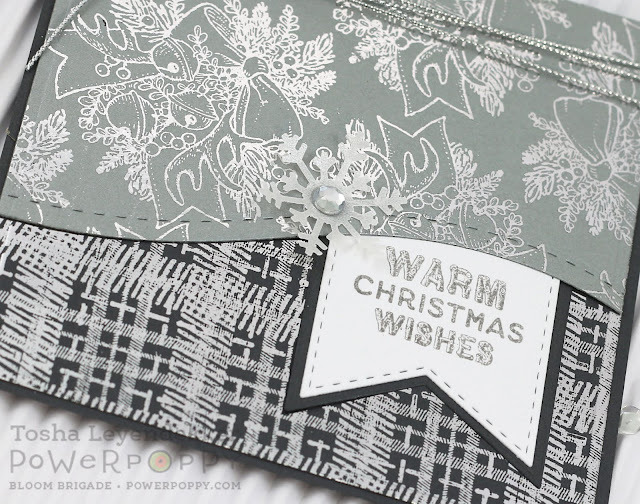 The bells are on matted silver cardstock, and the plaid is on a dark gray cardstock. The sentiment is also from the Through the Woods set. I'm honored that you stopped by today. I hope you'll return tomorrow for a sweet snowflake preview.